Jane White (1767-1811) b. Potterne, Wiltshire Co.; r. Bromham, Wiltshire Co. (Parents unknown) One source says that Jane was only 16 when she married. Children^: Were some of the older children born out of wedlock or from yet another marriage? Probably at least second marriage for Thomas if Jane was only a teenager. She would have been 19 when Richard and Sara were born. -buried: Cross Roads Cemetery, Pine Twp. 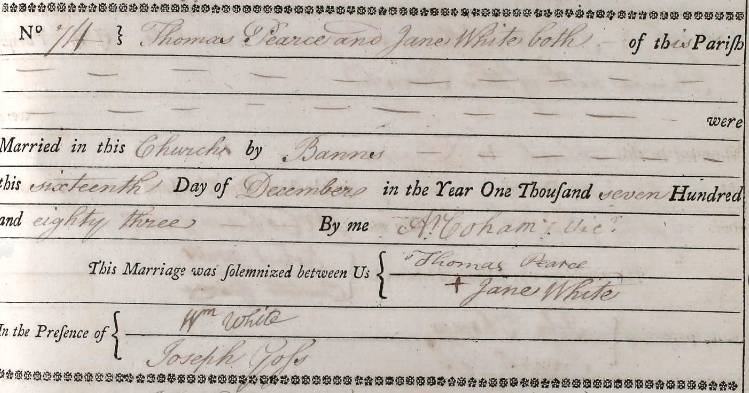 *Grandparents possibly Thomas & Jane of Mildenhall, Marlboro, who count 2 sets of twins, including Thomas & Jane (b.1692), among their 7 children in 12 years. ^It was not unusual to have children baptized days and even years after their births. These may be the only records available, and thus some confusion exists over ages. Oral tradition says that our Richard and Sarah were twins, and there were twins in earlier Pearce families. 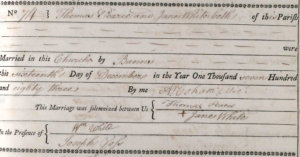 “Baptisms, Bromham, Wiltshire, 1775-1799.” 23 April 2015.